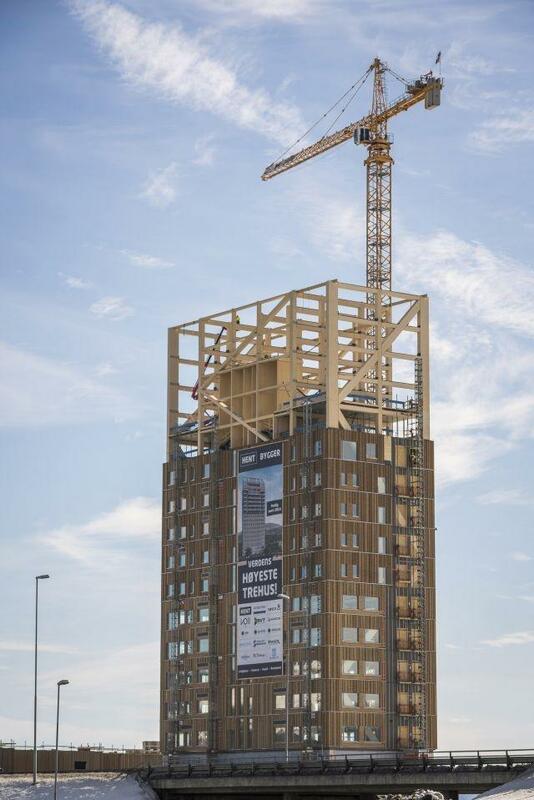 Norway has completed the frame of the world's tallest timber building, which is being lauded for being environmentally friendly and fire resistant. The Mjos Tower, which is situated near and named after a lake located about 100 kilometres (60 miles) north of Oslo, saw its last beam hoisted by a crane this week. At 85.4 metres (just over 280 feet), it has 18 floors. Promoters say that using wood, a renewable material, makes it possible to reduce CO2 emissions compared to concrete, which is the primary material of residential buildings in cities. "Building with wood is helping us breathe in a better world," said businessman Arthur Buchardt, who added he began the project after being inspired by the Paris agreement on climate change. Constructors say the building is fire resistant as it uses glue laminated timber that will only burn when continuously exposed to flames. When it opens in March 2019, the tower will surpass its 49-metre counterpart Treet (tree in Norwegian), which previously held the record of the world's tallest wooden building and is located in the western city of Bergen. The Mjos Tower is to hold apartments, an indoor swimming pool, a hotel, offices, a restaurant and common areas. It was originally supposed to be 81 metres high, but a roof-top pergola added another 4.4 metres. This addition makes it slightly higher than the HoHo tower (84 metres), currently being constructed in Vienna. This Austrian building has a hybrid structure combining wood (76 percent) and other materials, unlike the Mjos Tower. Other, even more ambitious timber projects have been proposed, including the Baobab tower in Paris (120 metres), though municipal authorities have turned that one down. The Abebe Court Tower in Lagos (87 meters), meanwhile, is still waiting to be built, according to the CTBUH, an NGO specialising in sustainable urban design.